After a couple of weeks of relatively easy training due to injury, I am back in the game. I wouldn’t classify my fitness as 100 percent yet, but it is coming back. I really think that my “meat-eating” sessions during my commute to work have helped. My forced recovery time did do some good for the brain, though, and I feel that I’m ready to jump into the next part of my season…Cyclocross! Look, there just aren’t winter triathlons here in the DC area, so I’ve got to do something. Besides, the mounting and dismounting for the obstacles and hill climbs plays to my strengths. The cold… not so much. Now that I am back to training, I have a dual focus. I am racing cyclocross this year and I have a 5K on 12 October. So, in addition to getting my running form back, I also have to concentrate on speed. Adding in the threshold work to prep for cyclocross, and it looks like I have a multiple personality disorder going on in my training. Actually, it’s not that bad. 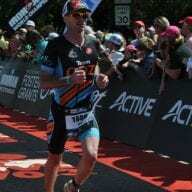 I have been following, for the most part, the Endurance Lab Ability Lab to get my legs back in to shape, but my inability to swim or run hard has really been the limiting factor. As I mentioned earlier, I play a game during my morning commute. I call it “meat-eating,” but it would be better understood as “predator-prey.” You see, I ride on a bike path to work, and there is one section that runs for about 7 miles that is full of commuters. In the early morning hours, I can see their tail lights and headlights flashing away in front of me. All it takes is for me to sense that I might be closing in on a rider in front of me, and my primordial urges take over. I view that rider as food or prey. Depending on whether I ate enough the night prior, I sometimes tell myself that overtaking the rider ahead of me will satiate my hunger. I know. I get it. I’m a bit off, but it helps motivate me. The other day, I was able to roll at 165 beats per minute on my single-speed bike and cover the 15K in about 32 minutes, including stopping at traffic lights and for an ID inspection at the entry gate to work. I had a good time that day, so I guess I can’t complain. Besides my daily VO2 sessions, I am really focused on developing my aerobic engine again, spending much of my running time in a lower heart rate zone. Being that I do have a 5K race coming up, though, I have started doing some speed work in preparation. It hasn’t gone all that well, but it’s not horrible. I was able to do 6 400-meter efforts in under 80 seconds pretty easily, so I’m not too far off. I’m not anywhere near where I would like to be, but I’m not at a pedestrian pace. So, I’m at least starting from an ok place. Due to the vegetation and the buildings along my favorite run routes, I continue to rely on the power data from my Stryd footpod. Over the winter, I plan to play with it quite a bit more, so I plan to deliver more data testing to you on the efficacy of training with power on the run. Now that I have settle in to my new place, we got the SkillZ and DrillZ Ride rolling. On week one, we focused on just staying together as a group. Zwift, and IRL rides, can be very tough if you struggle to hold the wheel in front of you. During week 1, we practiced working on simply holding the wheel in front of you and how to pull through. During week 2, we covered how to use the draft to recover and benefit. One of the things I have seen both on Zwift and in real life riding is the under-utilization of the draft to allow the legs to recover. For example, when returning to the group after being dropped or bridging from one group to the other, riders should take advantage of the draft to get their legs back under them unless they plan to immediately go over the top to attack the recently caught group. Too often, riders in Zwift accidentally put themselves on the front of the group that they caught because they do not understand how to use the draft to their advantage. In week 3 we built on the the concepts of the previous two weeks and focused on attacking the bunch. 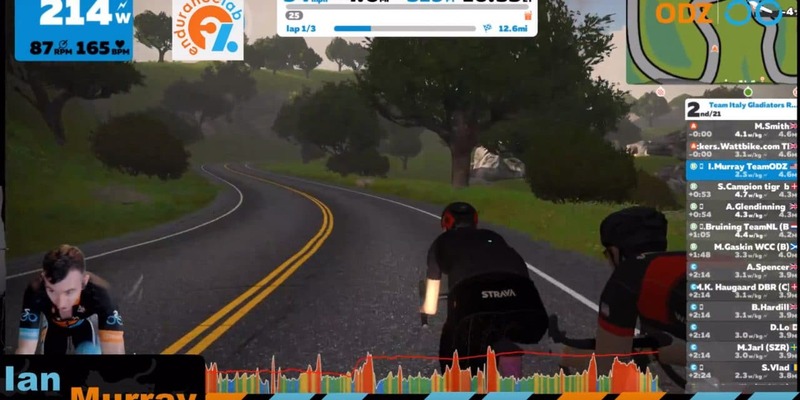 In this instance, the goal was to show the difficulty in breaking away from the group and how the effects of group aerodynamics on Zwift can play into the chase. During the class we had riders launch individual attacks and then settle into a pace that was at or slightly less than that of the chase group. As the riders settled in after the short attack, the group was easily able to pull the rider back due to sheer number. Now, in a real life situation, the riders would have to take turns to pull the group back, but the concept remains the same. A group can move faster on Zwift than an individual if it bunches up fairly tightly. During the first iteration, rides were capped during their attack to show how quickly a five to eight-second gap can be pulled back by a large bunch. During the second iteration, riders were not capped during their ten-second attack, and some were able to gain a significant advantage over the bunch. The key takeaways were that an attack has to be done at a significantly harder effort than that of the group, and an attacker has to be in a good position to attack. Otherwise the rider will have to expend a significant amount of energy moving through the group and creating a gap. Now that I am back to training a bit harder, I decided to get into some racing on Zwift. The cool thing is that I have a weird schedule right now. Some days, I am done by noon. Other days, I am done by 5:30 PM. Actually, none of that is correct. I am currently in an accelerated graduate degree program, so I am basically doing a Master’s degree in 12 months vice 2 years. That means my day often officially ends at about noon. Now, I am not done with “work,” as I have at least 100 pages of reading per night. But, it does allow me to jump into races that I would not normally be able to do. This last week, I did just that by entering the Team Italy Gladiator Race. Well, that’s it for me the week. Next week, I’ll put up some video from my cyclocross race, so you can share in my misery. If you feel like joining us for the SkillZ and DrillZ Ride, join us at Wednesday at 6:30 PM EDT (east coast US). Until next time Ride On!